In the second such deal in the Indian mutual fund industry within a fortnight, US-based mutual fund, Pioneer Investments Management Ltd on Friday signed a joint venture agreement with Indian public sector bank Bank of Baroda to pick up a 51% stake in the existing Bank of Baroda Asset Management Co. (AMC) Ltd that currently manages Rs96 crore (as on 31 August). Earlier, on 26 September, another public sector bank—Canara Bank—had entered into a joint venture with European Robeco Group NV, wherein Robeco will buy 49% stake into Canara Bank’s existing asset management arm, Canbank Investment Management Services Ltd (CIMS). The bank’s AMC will be renamed Baroda Pioneer Asset Management once the deal is complete. Banking industry analysts say the deal could be valued at around 10% of the corpus managed by the bank through its mutual fund arm. Pioneer is re-entering the mutual fund business in India; in 1993, it had entered into a 50-50 joint venture with the Chennai-based Shyam Kothari family (through ITI, or Investment Trust of India). Addressing the media in Mumbai, Dario Frigerio, global chief executive officer of Pioneer Investments, said despite two earlier attempts to survive in the mutual fund industry in India, this time he was confident about the future of the current joint venture. “We are two times the size of what we were six years earlier and can make investments as required into India," he added. 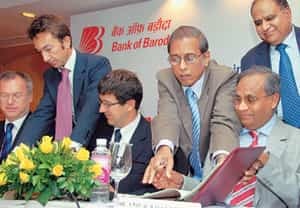 Terming the entry into the Indian market a “strategic initiative", he said Bank of Baroda has a “strong footprint across the country and a deep understanding of the market." The AMC will be jointly branded and, Frigerio said, business will begin between April and June. It will initially offer equity, fixed income and balanced funds. The group is also looking at including an Indian product in the group’s international fund umbrella which is distributed across Europe and the US. The new joint venture will also concentrate on third-party distributions, that is, the distribution of products through existing relationships with private and foreign banks. Anil Khandelwal, chairman and managing director of Bank of Baroda, said Pioneer matched the legacy of the bank and was known for its expertise in fund management. “We recognized that it is time for us to offer our customers world-class mutual fund services and fulfil their investment requirements," he said. The joint venture would help the bank enlarge its basket of products to 29 million global customers, he added. The bank has 1,100 branches in India and more than 63 offices abroad. At the time of Pioneer’s first venture with ITI, the Kothari Pioneer Mutual Fund was the first private sector mutual fund in the country. In 2000, the AMC’s ownership changed hands when ITI was acquired by TCK Finance. The AMC was then renamed Pioneer ITI. In 2000, the Pioneer Group was acquired by UniCredit Group, an Italian bank, and so there was a change of ownership once more. In 2002, Pioneer Group decided to exit India and the partners sold out to Franklin Templeton Investments, which had been operating in India since 1996.